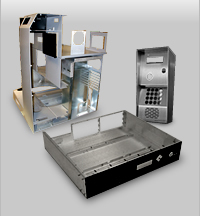 We utilize new automated CNC equipment and proven manufacturing practices, and continually seek to improve our processes and upgrade our equipment to stay at the leading edge of our industry. Our commitment to quality ensures that we are able to produce superior products for our customers. Our inspection team inspects all of our work in process as it moves through our shop and at the Final inspection area and completes any reports necessary, such as: Material certification, First Article Report and Conformation of compliance. We also offer light mechanical assembly with a skilled work force and purchasing team to support your assembly needs.